Social media is a way for your clients and customers to communicate with you. But what happens when what they want to say is negative? Like, really negative? The risk that comes with social media is that you can’t control what people say, and you can’t control who sees it. Maybe you delete or block negative users, but that can create a whole new type of blow back- why aren’t you facing the criticism? Blocking doesn’t equal solving the problem. Instead of running from the problem, here’s hat to do with negative social media feedback. First things first; you can’t run from the negative feedback. You have to face the music. Try to understand what people are mad about; are they dissatisfied with your services? Do they feel like you mislead them about your experience? Are they mad at something you said in an interview? Take the time to HEAR what they are saying, and see how you can address it. Maybe it’s something out of your hands, like USPS taking longer to deliver because of weather conditions. Or maybe it’s because of your attitude towards your customers. Feedback (even negative feedback) can be a great way to grow, but you first need to listen. Small companies may have just one person who does all the work. Meaning you might be on deadline when you start getting a flood of negative comments for something else. You have to finish the work, but you can’t take too long to answer the comments, because things can get out of control easily. However, one of the biggest mistakes you can make is to respond when you feel heated yourself! No good comes from yelling back at someone yelling at you on the internet. Read the comments, take some time to formulate your response, and then click ‘send’ when you’re calm and can stand behind what you’ve written. Saying something in the heat of the moment is bad business. Especially on the internet, where things never really die. Even if you delete your comment later, screenshots can easily be taken. If you said or did something that was offensive, be ready to apologize. Step outside of your experience, understand that you hurt people, and apologize. Negative social media feedback is a part of our online world. But handling it gracefully is a way to keep your business running smoothly and your customers happy. This article originally appeared in Due. This article was written by Kara Perez from Business2Community and was legally licensed through the NewsCred publisher network. Please direct all licensing questions to legal@newscred.com. Successful email marketing is a critical, and often overlooked, element of digital marketing. 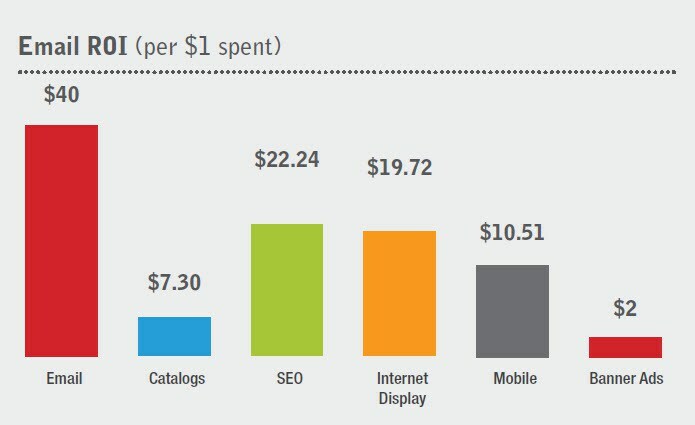 Take a look at the graphic below and you’ll see how important successful email marketing is to your bottom line–generating nearly 2X the ROI of the next more cost-effective tactic. Successful email marketing requires 2 tactics: 1) list building and 2) email campaigns. 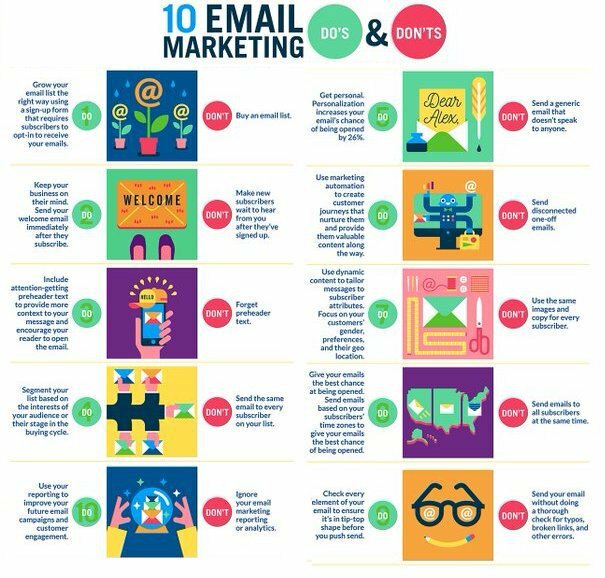 Before you can have a successful email marketing campaign, you need a good list. In the bad old days before CAN-SPAM, you could simply buy a list and spam a bunch of folks with your message. Some experts advised against such “cold messaging”, but it worked well if you were very selective in purchasing a list of likely buyers. List buying was an art in those days and I got paid a lot of money to guide businesses on which list purchases were likely to result in high returns. And, selling lists is what kept a lot of small, specialty magazines in business–they provided unique access to highly targeted subscribers. Now, of course, you can’t buy lists, so you have to develop your own (and comply with CAN-SPAM regulations which you can find by following the link above). Since, the law makes your email client (for instance, Constant Contact, AWeber, or MailChimp) responsible for your violations, they can get hit with a big fine, so they’re invested in keeping you honest in this. So how do you go about building a list? Don’t ask for information you don’t need so it’s fast and easy for visitors to sign up. Maybe all you need is an email address and name. Don’t forget you can get additional information after they sign up. Make your sign-up form obvious without interfering with user experience (I hate those popups that block content until you either sign up or x out). I prefer a small band at the bottom of the screen that asks for an email address or something that pops up as the visitor starts to scroll away from your site. Remember, your website is critical for SEO and you don’t want to mess with anything that reduces visits, bounces, or time on site. When you send an email, include social sharing and the ability to subscribers to forward your email to a friend. These are great ways to build your list. Your email client should make it easy to create attractive and professional email campaigns to subscribers. I use AWeber because of their flexibility and ease of creating campaigns (they recently added drag and drop capabilities). Your goal. What do you hope to accomplish with the email. Timing — how often, time of day, day of week, etc. Sure, email is available whenever a user wants to view it, but it’s more likely to get opened soon after it’s sent. The better your timing, the better your open rate. Make your email easy to read and inviting on multiple screens (especially mobile) with great design. Just like everything in marketing, the message is everything. Make your content (both text and images) attractive and inviting, use lots of white space and a little humor doesn’t hurt. The more an email looks like a personal conversation with a friend, the better it will perform. Personalization doesn’t end with including the person’s name. Make the email look like it was designed especially for each reader. Don’t waste your readers’ time with nonsense: say what you need and provide links to more information. You don’t want to overload your readers by sending too many emails, but you want to use your email marketing to build loyalty and engagement with your target audience. That’s a tight balancing act. And, there’s no one-size-fits-all answer to this question. A good gauge of the right frequency comes from analytics. If your open rates drop or you start getting complaints or a bunch of folks unsubscribe, you’re probably emailing too often. If you’re not getting folks unsubscribing or complaining, you could probably send more frequent emails. The key is to send emails when you have something worth saying to your audience. Marketing automation often receives a negative knee-jerk reaction because it sounds like you’re treating your subscribers as robots who all get treated the same. But, it’s actually the opposite. Whether you prefer Salesforce or Hubspot or some other marketing automation tool, successful email marketing requires you send the right content to the right people at the right time and that means using marketing automation. No marketing automation platform works well unless you spend time keeping information up-to-date to ensure the content the subscriber receives is targeted to their product interests, stage in the customer journey, and other key elements, like gender. Performance of your email form–I do this by setting up goals in Google Analytics, but AWeber also shows me how many times my form was shown and how many subscribers were generated. I periodically do A/B testing to determine the optimal form, placement, etc. Campaign performance–how many opens, how many clicks, and, if you’ve installed tracking codes, goal completions based on each campaign. This article originally appeared in Hausman Marketing Letter. This article was written by Angela Hausman and PhD from Business2Community and was legally licensed through the NewsCred publisher network. Please direct all licensing questions to legal@newscred.com.